← Let’s Play Catch Up! We’ve lost the man who defined the backbeat of Rock & Roll. More importantly, we’ve lost a gentle, humble man with an easy, shy smile who we were privileged to know, Dominic Joseph Fontana, better known throughout the world as D.J. Fontana. 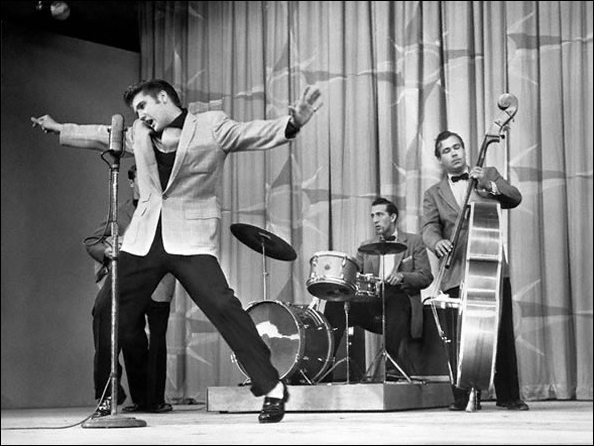 When Elvis Presley added a drummer to the original “Blue Moon Boys,” Scotty Moore and Bill Black, it was D.J.Fontana. With the dawn of Rock & Roll and Elvis’s popularity on shows like the “Louisiana Hayride,” D.J. was finally able to move his drum set from behind the curtain (Country audiences of the time were not as accepting of drums) to the main stage where he stayed and innovated for the rest of his career. All it takes is one listen to Elvis records such as “My Baby Left Me,” “Hound Dog,” “Trouble,” and, of course, “Jailhouse Rock” to hear how D.J. laid down a beat “like a ton of coal” to drive the Presley express in the recording studio. Our personal introduction to D.J. didn’t happen until after the King had already left the building and, along with Scotty Moore, D.J. was performing at, and helping to promote, various tribute shows that he appeared in. Unlike some performers with his degree of notoriety, we always found D.J. to be very accessible and easy to talk to. We interviewed him several times and, while we always felt comfortable with him, were pleasantly surprised when we found out that he was comfortable enough with us to share his home phone number with us. Speaking of home phone calls, one time while we were on vacation, Johnnie’s mom was in our house feeding our cat when the phone rang and voice mail kicked on. It was D.J. leaving us a message. Being a huge Elvis fan and a Tennessee girl, she was beyond excited and had to quickly call us and give us the news that the one and only D.J. Fontana had left a message on our answering machine. She was so excited, she couldn’t even remember what the message was. Thankfully, she didn’t erase it. D.J. was a frequent visitor to the Chicago area, playing many of the “Elvis Tribute Birthday Spectacular” concerts and we would also run into him on other occasions such as the NAMM (National Association of Music Merchants) Show, in Nashville. 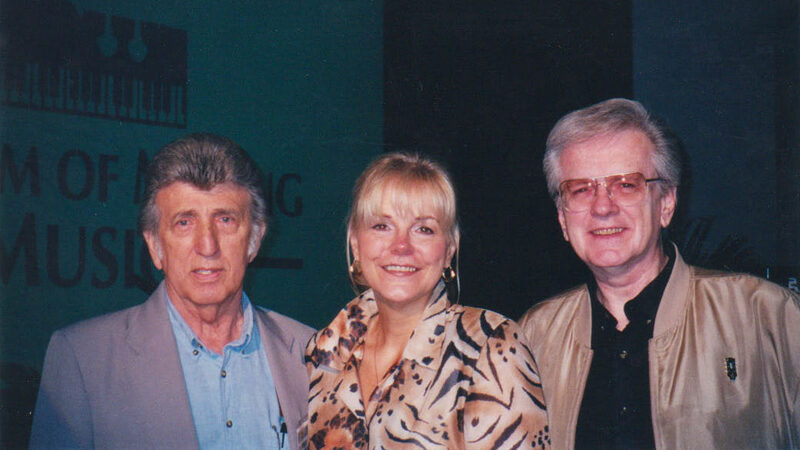 On May 1 of 2001, we were honored to be invited to co-host a Rockabilly Hall of Fame special concert, “Rockin at the Ryman,” at the legendary Nashville auditorium with music greats such as Brenda Lee, Crystal Gayle, Boots Randolph, Billy Burnett, the Jordanaires (Elvis’s vocal back up group) and many more. During a special tribute to Gene Vincent & his Blue Caps, Steve got to perform as an “honorary Blue Cap” playing guitar and singing Gene’s “Dance To The Bop” with Bill Mack of Gene Vincent’s Blue Caps on bass and D.J. on drums. It was a “moment” we will never forget. D.J.’s post-Elvis career wasn’t limited to just tribute shows. He could regularly be found in studios or on stages with Paul McCartney, Jerry Lee Lewis, Ringo Starr, Roy Orbison, Dolly Parton, Charley Pride, Waylon Jennings and more. Our friend, Ronnie Rice tells the story of recording in Nashville and being pleasantly surprised that D.J. was holding down the beat. Then life is just a one-night stand. And now, they’ve got one HELL of a drummer! This entry was posted in Music, Partly Personal and tagged Bill Black, Billy Burnett, Charley Pride, D.J. Fontana, Dolly Parton, Elvis Presley, Jerry Lee Lewis, Johnnie Putman, Life After Dark, NAMM, Paul McCartney, Ringo Starr, Rockabilly Hall of Fame, Ronnie Rice, Roy Orbison, Scotty Moore, Steve & Johnnie, Steve and Johnnie, Steve King, The Blue Moon Boys, Waylon Jennings, WGN, WGN AM, WGN Radio. Bookmark the permalink. Thanks, Jay! Coming from you, that means a lot.